I often get asked where I find the inspiration for some of my recipes and I often say that I’m inspired by other foods that I eat and drink, as inspiration really can come from anywhere. 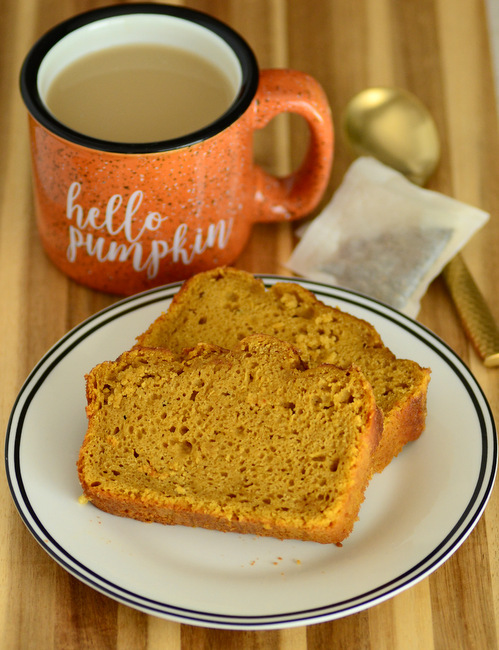 I found the inspiration for this Pumpkin Chai Spice Loaf inside of a mug – a pumpkin-colored mug that I just happened to be drinking a warm chai tea latte from! The Pumpkin Chai Spice Loaf is an easy to make quick bread that is accented with pumpkin pie spices and chai tea, perfect for slicing and serving up on a cool fall morning. To bring chai tea into the loaf, I infused some milk with chai tea bags. I recommend using two bags for half a cup of milk to get as much spice flavor out of the tea as possible. The tea-infused milk has a great spice flavor, but I further supplemented it with more spices in the bread itself. I added pumpkin pie spice, ground cinnamon and ground cardamom, along with vanilla and almond extracts. While there is cinnamon in the pumpkin pie spice, I always find that a little extra doesn’t hurt! The loaf also contains a generous amount of pumpkin puree. You can use fresh or canned puree and I usually opt for canned, since it offers a little more consistency than homemade pumpkin purees. That being said, both will work well here. The spices blend nicely with the pumpkin, producing a loaf that is very aromatic with just the right amount of sweetness. The loaf is quite tender, but it is still sturdy enough to toast the slices, if you prefer to serve the loaf warm. In a small, microwave safe bowl, bring milk and tea bags just to a simmer. Allow to steep for 5 minutes, then remove the tea bags, squeezing out the excess milk. In a large bowl, whisk together sugar, egg, vegetable oil, pumpkin puree, vanilla extract, almond extract, spices and salt until ingredients are very smooth. In a small bowl, whisk together the flour, baking powder and baking soda. Stir half of the flour mixture into the pumpkin mixture, followed by the milk. Stir in the remaining flour mixture and stir until the batter is well blended and no streaks of dry ingredients remain. Pour batter into prepared loaf pan. Sprinkle with cinnamon sugar. Bake for 45-50 minutes, or until a toothpick inserted into comes out with only a few moist crumbs attached. Turn out onto a wire rack to cool.